The global market for district cooling has gained a significant momentum in the recent past. The rising urbanization across the world, especially in Asia Pacific and the Middle East and Africa, has influenced the real estate sector, global, which consequently, is impacting the demand for district cooling to a great extent. The growing population in emerging Asian economies, such as China and India, leading to an increased consumption of building energy for heating and cooling needs, and the construction of high-rise buildings in Europe, North America, and the Middle East and Africa, which tends to decrease natural ventilation, thereby increasing the obstruction of buildings on each other, are likely to bring an upswing in the need for the mechanical means of air conditioning and, therefore, energy consumption. The rising primary energy consumption, peak electricity demand, and greenhouse gas emissions, are projected to increase the requirement of district cooling services as a sustainable energy solution, enabling local communities to gain the economic and environmental benefits of this technology over the next few years. Expanding at a CAGR of 5.10% between 2016 and 2024, the global market for district cooling is estimated to increase from US$11.1 bn in 2015 to US$17.3 bn by the end of 2024. On the basis of application, the global district cooling market is segmented into the residential, commercial, and the industrial sectors. The commercial sector has surfaced as the dominant application of district cooling across the world. In 2015, it led the overall market with a share of more than 50% and is anticipated to remain doing so over the next few years, thanks to the significant expansion in the commercial sector, worldwide. The growing emphasis on energy saving, together with the rising demands for BREEAM and LEED-certified buildings are likely to fuel the demand for district cooling in this sector in the near future. Hotels, restaurants, malls, shops, hospitals, data centers, laboratories, and various other commercial facilities are the key application areas for district cooling in the commercial sector. The industrial sector, on the other hand, includes power generation plants, manufacturing plants, chemical plants, and several other industrial facilities. Individual houses, buildings, and connections of individual flats in buildings come under the residential sector. The Middle East and Africa, North America, Latin America, Asia Pacific and Europe are the key regional markets for district cooling across the world. North America led the global market in 2015 with a share of nearly 48%. Although the rising temperature levels, increased incentives for the adoption of renewables, and the efficient usage of energy resources are expected to boost the adoption of district cooling technology in this region, the North America market for district cooling is likely to lose ground to the market in the Middle East and Africa in the years to come, thanks to its massive potential for DC development due to its hot climatic conditions. Ramboll Group A/S, ADC Energy Systems LLC, Emirates Central Cooling Systems Corp., Emirates District Cooling LLC, Stellar Energy, Keppel DHCS Pte. Ltd., Emirates National Central Cooling Co. PJSC, Logstor A/S, Tekla Corp., Shinryo Corp., Dalkia, Veolia, Singapore Power (SP) Group, and Alfa Laval AB are some of the leading players in the global district cooling market. The district cooling (DC) market report by Transparency Market Research provides in-depth analysis of the district cooling market globally. The report segments the market on the basis of application and geography. The report analyzes the global district cooling market in terms of both (cooling) energy sales volume (Tera Joules) and revenues (US$ Mn) for the years 2016–2024. For this research study, the base year is 2015, whereas the forecast is from 2016 to 2024. The report provides a comprehensive competitive landscape and features companies manufacturing district cooling systems. This report includes the key dynamics affecting the district cooling market globally. The analysis in the report provides detailed insights of the global district cooling market. The drivers, opportunities, and restraints of the market were analyzed in detail and are illustrated in the report. The report also provides a detailed industry analysis of the global district cooling with the help of the Porter’s Five Forces Analysis model. The research report is studied on the basis of the application and the geography. Based on application, the market is segmented into residential, commercial, and industrial. Commercial application segment dominated the global district cooling market in terms of both energy sales volumes and revenues. Residential application segment closely followed commercial application segment. Residential application segment held around 40% market share of the global district cooling market in 2015. Geographically, the global market is classified into five regions and further into 26 unique country sub-segments. The regional segments are North America, Europe, Asia Pacific, Middle East & Africa, and Latin America. The 26 countries which have been separately addressed in this report are the U.S., Canada, Sweden, Denmark, Sweden, Austria, Germany, France, Finland, Italy, China, Malaysia, Philippines, Singapore, India, Indonesia, South Korea, Japan, Saudi Arabia, UAE, Qatar, Bahrain, Kuwait, Oman, South Africa, Brazil, and Mexico. 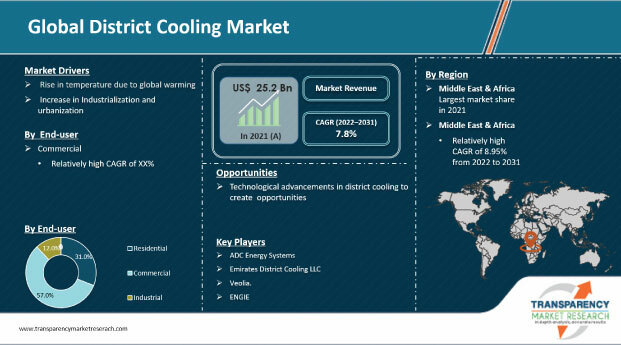 District cooling market in each country and region is further sub-segmented by application into residential, commercial, and industrial. North America held the major share of the global district cooling (DC) market in 2015, accounting for around 50% of the global market share. Middle East & Africa was the second-largest market for district cooling systems, followed by Asia Pacific in 2015. Europe and Latin America held the fourth-largest and fifth-largest share of the global district cooling market in that year. Some of the key market participants in the district cooling market are ADC Energy Systems LLC, Emirates Central Cooling Systems Corporation (EMPOWER), Emirates District Cooling LLC (Emicool), Emirates National Central Cooling Company PJSC (Tabreed), Stellar Energy, Keppel DHCS Pte. Ltd., Logstor A/S, Ramboll Group A/S, Tekla Corporation, Shinryo Corporation, Dalkia, Veolia, Singapore Power (SP) Group, and Alfa Laval AB among others. The report provides an overview of these companies, followed by their financial details, business strategies, SWOT analysis, and recent developments.